Maki smoothed the creases of her uniform. She was dressed in her school uniform. His uniform was torn at the knees and elbows. A man in uniform came down the stairs. Our school has a rule that we wear a uniform. In the U.S., only a few exclusive schools make children wear uniforms. Our school requires us to wear a uniform, but that school allows ordinary clothes. Do all the schools require uniforms? Basically, except for Tokyo’s public schools. 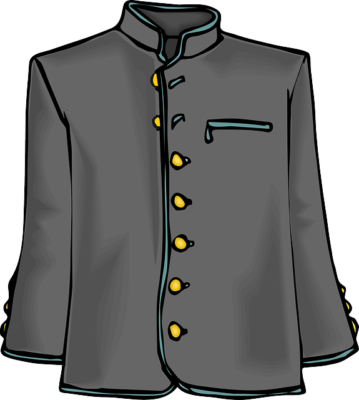 Uniforms identify the individual as a member of a certain organization. The school uniform is worn on school trips. We wear blazers at our high school. The pupils at this school wear a simple uniform. The school authorizes two kinds of uniforms. If you look at their uniform, can you tell which high school they go to? The bank changed the color of its uniforms from dark blue to brown. His uniform was covered with braid and medals. My daughter actually said her uniform is the main reason she chose her high school. A uniform would give the guard a semblance of authority. Uniforms are a huge thing for junior-high and high school girls. The little boy strutted in his new school uniform. You look nice in your uniform, Mark. She chose this senior high because she was taken with the uniform of this school. That uniform is neat, isn’t it? To put on the uniform again gives me a turn of disgust. The uniform was cheaply made and already beginning to fray. He took an instant dislike to the silly uniform. The new school uniform is unpopular among the students. Why do women have to wear uniforms in this office? I looked hideous in my school uniform. We will provide you with a uniform, but you have to use your own shoes. The company supplied us with uniforms. Workers have been supplied with averalls.